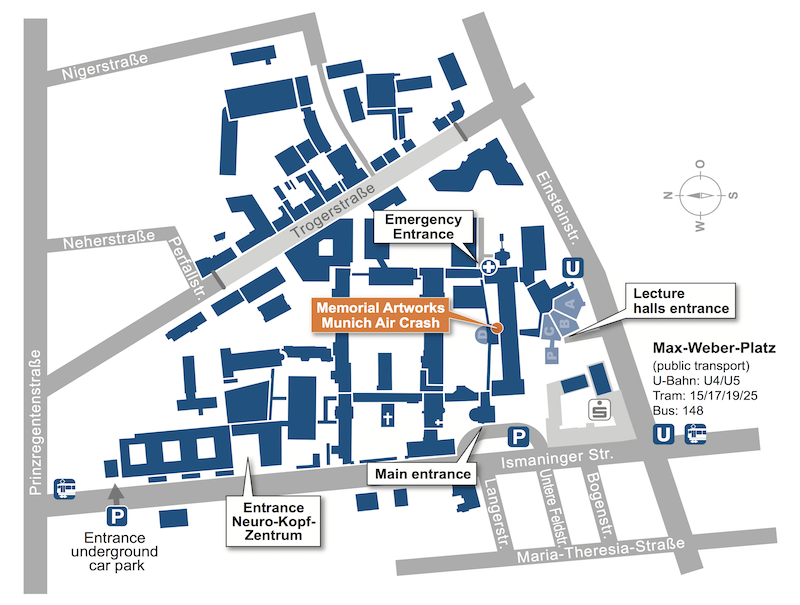 If you arrive at the Munich airport you can use a taxi or the train (S-Bahn) to get to the Klinikum rechts der Isar. A taxi will bring you to the Klinikum rechts der Isar in approximately 45 min and costs around 70-90 Euros. For the train (train costs around 10 Euros, duration about 50-60 min) follow the signs S-Bahn at the main terminal of the airport to the train station. 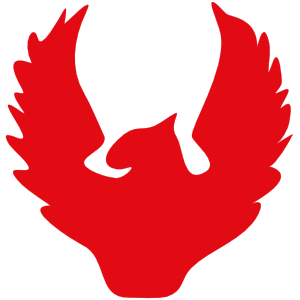 We recommend using the line S8 towards Munich (München) to the station “Ostbahnhof”. Then change to the underground line U5 or U4 (U-Bahn) in direction to “Max-Weber-Plat” and get off at the station “Max-Weber-Platz”. Follow the signs “Einsteinstraße” and “Einsteinstraße/Klinikum rechts der Isar”. Follow the signs to the underground station and take line U4 Arabellapark or U5 Neuperlach. Get off the train at “Max-Weber-Platz” which is only four stations from the central train station. Follow the signs “Einsteinstraße” and “Einsteinstraße/Klinikum rechts der Isar”. 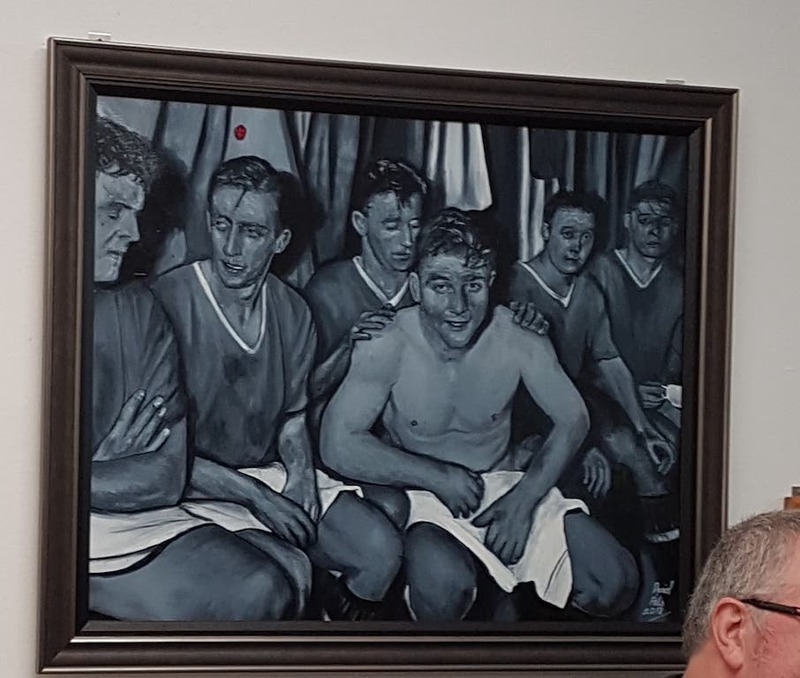 In February 2018, the Manchester Munich Memorial Foundation commissioned a local Manchester artist and Red, Daniel Potts, to paint 2 oil pieces, one of the Babes in the dressing room and one of Sir Matt leaving the Rechts der Isar hospital. This was done as a gift to the hospital to commemorate the 60th anniversary and was greatly appreciated. Thanks go to Steve Donoghue for leading this particular project. 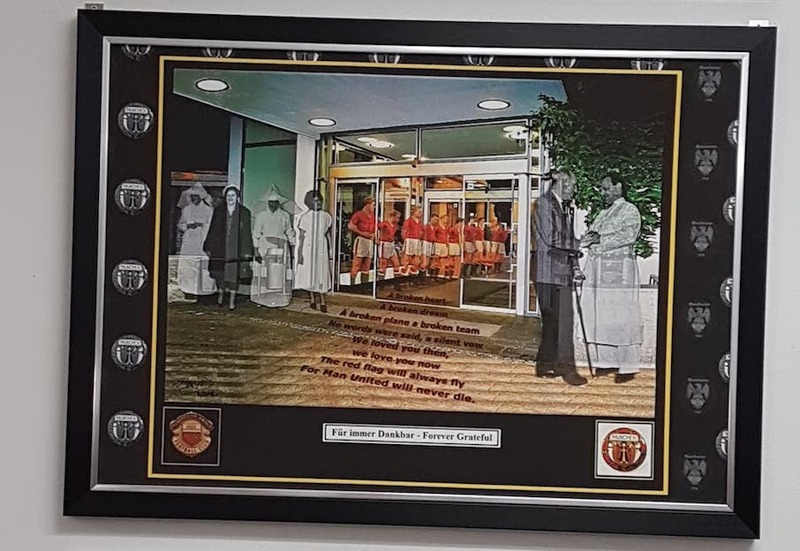 The artwork is located in the hospital at the closest point to where Sir Matt and the Babes were treated 60 years previously. To find the artwork, please follow directions using the downloadable map.